Blackhall Athletic ran riot against 9 man Edinburgh South. The home team started the game with a full eleven, one more player than their opposition but were still tested at times during the match. Dugald Williams was handed the captains armband, and the team lined up in a 442 Formation. The first half was lively right from the off, and the opening goal came after just 3 minutes, when calamity struck at the heart of the defence. Dugald’s challenge was weak, and left back Fallilou was unable to prevent the Edinburgh South number 10 from getting beyond him, and hammering the ball into the back of the net to give the away side an early lead. The response from Blackhall was encouraging, and dangerous striker Brandon closed down the keeper well, but saw the ball cannon off him and go out for a goal kick. The hosts came forward again, and exciting winger Nathan Gallagher saw his shot fly harmlessly over the bar. Gallagher was again at the heart of the action, he bullied the defence, went on a winding run, his shot was blocked, but the ball went high up in the air and was nodded in by target man Zane Ewart to level the scores up. Jamie Campbell and Calvin Catala formed a formidable partnership in the middle of the park, breaking up play and allowing nothing past them. Blackhall began to grow into the game more, and won a corner after 20 minutes, which was headed just over by rock solid centre back Thomas Hedges. Jamie Campbell then hammered his shot just wide of the post after some fantastic build up play by Blackhall. For all the home sides hard work they found no reward, and Dugald Williams was again making headlines when he gave away a penalty (albeit soft) from Blackhall’s own throw in, he was bullied off the ball and brought down his opposite number to allow Edinburgh a chance to take the lead. Number 10 stepped up for Edinburgh South, and converted the penalty low and hard to the left of the goal, leaving keeper Arin rooted to the spot. Blackhall dusted themselves off and Nathan Gallagher was played in well by Jamie, but again his shot cannoned off a defender. Blackhall found a way back into the game when Brandon struck a goal of the season contender, sending the ball fizzing into the top left corner and drawing the scores level yet again. Zane was tearing the defence apart with his intricate footwork, and won a free kick after 40 minutes. The striker delivered a tantalising cross to the far post which was headed in by the midfield maestro Jamie Campbell, to give Blackhall a well deserved lead toward the end of the half. The drama of the opening half didn’t stop there though, and Edinburgh South were gifted another soft penalty after Brandon was deemed to be pushing inside the box. 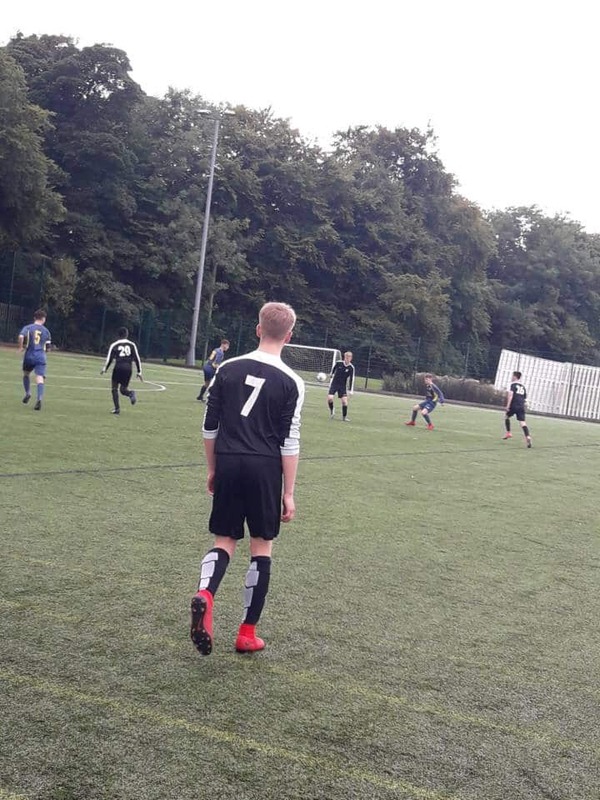 The unnamed number 10 for Edinburgh south put the ball on the penalty spot, and rolled it into the back of the net to bag his hat trick in injury time, to make the score 3-3 at the end of an exhilarating first half. Blackhall made two changes at the beginning of the half with Dugald being replaced for Gregor Rolland, and Joseph Brodie coming on for Jamie Campbell after a thoroughly dominant midfield performance. Zane started this half the way he ended the first, beating men for fun. He went on a good run again, but was unable to produce anything at the end of his dribble. Zane finally got his big moment when he was played through from a goal kick and gobbled his chance up, taking the ball beyond 2 defenders and calmly slotting it into the back of the net. Edinburgh South put numerous balls into the box, all of which were dealt with expertly by Thomas Hedges, who was leading the back line brilliantly. Edinburgh began to get a foothold in the game, and had a free kick that zipped wide of the post, and then number 11 was played through but couldn’t finish the chance, letting Blackhall off. Nathan Gallagher was again driving at the opposing fullback, and won a corner. Jamie Campbell was re-introduced to the game, with Calvin Catala coming off with a fine performance under his belt. The corner was swung in, and Jamie towered above everyone to send a looping header into the back of the net with just his first touch since coming back on to make it 5-3. Blackhall once again dominated the game, and drew multiple fouls from the opposition. A long awaited booking was finally given to the mouthy number 5 of Edinburgh South, for dissent. From the resulting free kick Nathan forced an exquisite save out of the man between the sticks, to make sure the score stayed at only 5-3. The home side racked up the chances in the final third of the match, Nathan and Zane linked up well and Nathan brushed the post with an ambitious effort, the ball fell to Brandon who had his shot blocked and easily saved by the keeper. The ever present Edinburgh South number 10 was finally shown the yellow card for dissent, after continually talking back to a questionable referee. LIGA NOS: Benfica, Sporting and Porto win.